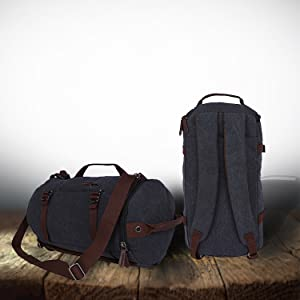 Buy FUR JADEN Canvas Men’s Black 27L Duffle Travel Bag with Backpack and Long Shoulder Strap @ 57% Discount. 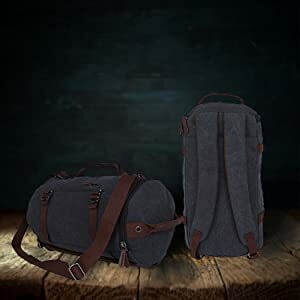 Get your globe-trotting in high swing with this practical duffel bag, while also carrying your required essentials on the go. The minimalistic design allow the millennial in you to travel anywhere without any hassles. This versatile duffel bag from Fur Jaden can be carried as a stylish gym bag or a backpack as per your convenience. 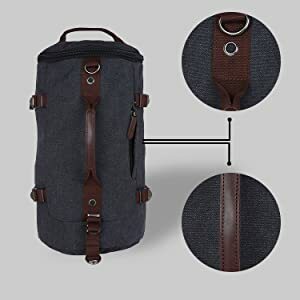 Brand Description: Fur Jaden backpacks are young, vibrant and fashionable accessories which are also a symbol of sophistication. This backpack is high on aesthetics as well as on utility and functionality. 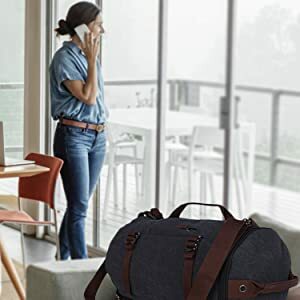 This durable duffel bag from Fur Jaden can be taken along with you for those business trips or weekend getaway. Fret not on your escapades as this will bear the wear and tear of consistent use in the long run. 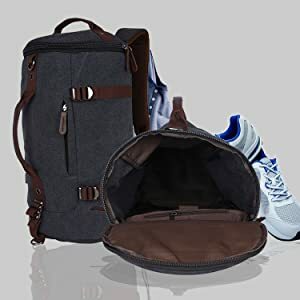 Sport this stylish bag at the gym while storing an extra pair of, shoes and your protein shakes in the large separate compartment provided. This also has a laptop sleeve to fit in a 14 inch laptop. 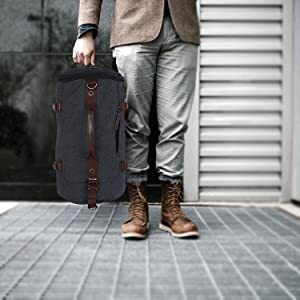 For stylish travel, this duffel bag, made from great quality canvas which is highly reliable. It is also great for everyday trips to the gym which makes it convenient for you to carry your gym overalls. With a convenient 2-in-1 design, this duffel bag features back straps and also a long strap. You can use this as backpack or put it across your body to make it look sporty. The forward-thinking minimalistic design of this duffel bag from Fur Jaden enhances the sturdy looks of it. Making it so stylish yet the versatile functionality of it creates an endless list of possibilities to carry about will captivate the on-lookers as you go. For those unpredicted trips, just grab your valuables and essentials and you will be good to go. Just pack your stuff and go on a whimsical adventure to complete your bucket list.